What he has been hiding? The significance of his homosexuality? And why, by the way, might California in 1949 be just the spot, as it were, on the geohistorical map for the psychoanalytic mode of talking about what one is hiding about oneself? We explore a range of possible answers to that question, including biographical and ideological. Julia and Al note in particular that this was the time of anticommunist investigations into “disloyal” faculty teaching in the University of California system, especially at Berkeley – that jobs, but also identities (including secret identities) were at risk. (Spicer was among those who refused to sign the loyalty oath imposed on faculty by the state government.) Whereupon Conrad observes that the witch-hunts almost inexorably targeted gays both open and closeted. Rachel concludes with a cogent interpretation of the gendering in the poem and of the sexual hiding. What remains wide open is the question of whether, in the end, this poem says mockingly and happily goodbye to psychoanalysis as a mode of self-understanding, or affirms analysis as having done its job for the poet in particular. Does the realization that “a poem could go on forever” seem to affirm the talking-through process, the topical wandering, the going wherever thought goes? Or does that just add to the torture of this endless summer? Both, it would seem. This episiode of PoemTalk was engineered and directed by James LaMarre and edited by Steve McLaughlin. 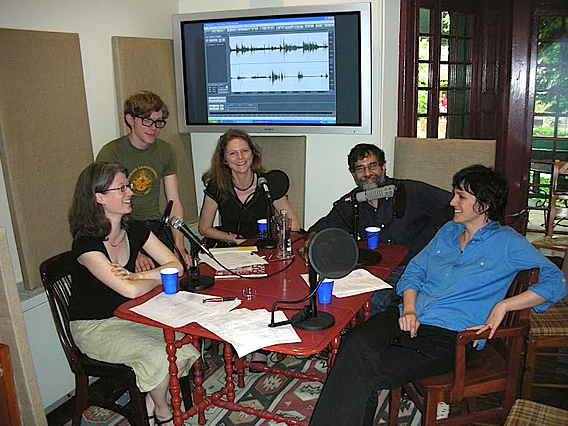 It was recorded as usual in our third-floor garrett studio at the Kelly Writers House in Philadelphia. 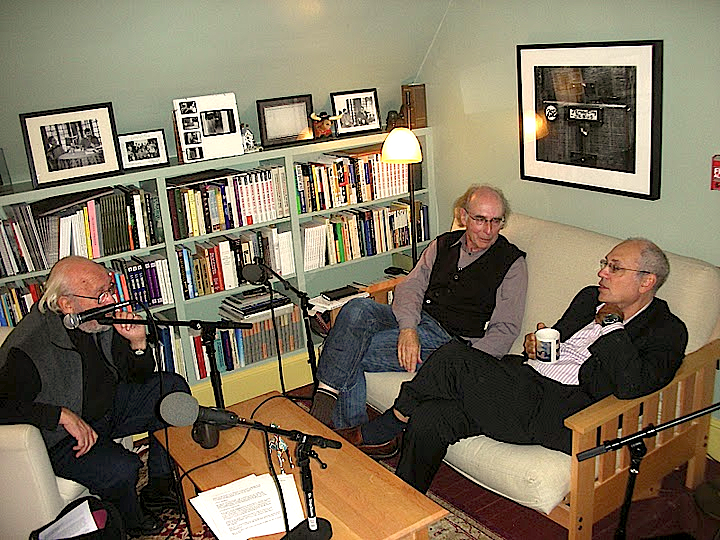 Next on PoemTalk: Rae Armantrout is in town and is joined by Tom Devaney and Linh Dinh to talk about Kit Robinson’s “Return on Word.” After that, Robert Grenier, another Californian, comes east to talk with Charles Bernstein and Bob Perelman about two short William Carlos Williams poems to which Bob Grenier goes back again and again--an episode, thus, that makes Williams the first poet featured twice in our series, which will by then be marking its 30th episode. Above from left to right: Rachel Blau DuPlessis, CA Conrad, Julia Bloch.